A manual assisted PNF based stretching system that stretches the muscles and fascia (connective tissue) of the body. FST is conducted in one hour long sessions for the majority of clientele looking to improve mobility, make lasting improvements in flexibility, and help relieve tension and chronic pain. 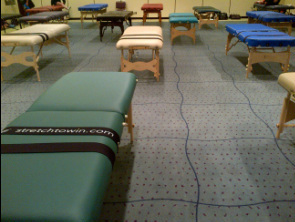 Mobile Massage tables prepped for Fascial Stretch Therapy™ depicted above. FST is based upon research in anatomy. It's focus is to stretch fascial lines that run throughout the entire body. FST targets the fascia (connective tissue) that houses and connects muscles, bones, tendons, and organs. The fascia also houses much of the circulatory and lymphatic systems. This is what Fascia looks like under a microscope!